A child psychiatrist is calling for "exercise ratings" on motion-controlled videogames, saying that such a system would be a valuable tool in the fight against childhood obesity. Videogame ratings are nothing new but they're generally seen as a way to help determine whether or not a particular game will turn your child into a remorseless axe murderer as he blossoms into adulthood. But child psychiatrist Paul Ballas thinks it's time for a new kind of rating for a new kind of videogame. 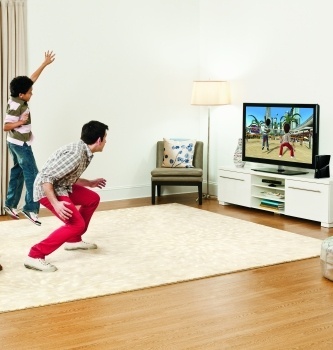 He wants to see "exercise ratings" for games that take advantage of the Kinect, Move and Wii motion-sensing controls. Sedentary: Games played by pushing buttons while seated. No increase in heart rate, no increase in metabolic rate. Comparable to reading or watching television. Low intensity: Games that result in an energy expenditure of two to four times the resting metabolic rate. Comparable to walking. Moderate intensity: Games that result in an energy expenditure of four to six times the resting metabolic rate. Comparable to brisk walking. High intensity: Games that result in an energy expenditure of six to eight times the resting metabolic rate. Comparable to jogging. "If the videogame industry puts its immense resources into developing fun games that give players a cardiovascular workout instead of simply churning out the type of couch-bound, pixel-hunting games companies have often been forced to defend, there is a real chance of striking a blow against childhood obesity, which has become a major public health crisis in the United States," Ballas wrote in an article for Wired. "An exercise rating system could estimate the calories burned by the average person in an hour of gameplay. The label could range from 'Sedentary' for lean-back, button-intensive shooting games to 'Active' for games with a calorie-expenditure rate comparable to playing basketball," he continued. "Implementing such a system would go a long way toward helping families make informed decisions about gameplay. The videogame industry should seriously consider such a policy, so that videogames can become part of the solution when it comes to childhood obesity." It's an interesting idea, although I see it as more of a marketing tool than a legitimate rating system, as publishers play up their games to parents as being good for their children. In either case, I'm not quite as optimistic as Ballas that motion-based games will "revolutionize" the fight against childhood obesity. I tend to subscribe to the old-fashioned notion that if videogames are turning kids into a bunch of fatties, then maybe the solution isn't more ratings, but less videogames.